The Cubs open the 1908 season as the defending champions. They play in Cincinnati against the Reds, one of the worst teams in the National League. Stud pitcher Orval Overall has a shaky first inning, but settles down after that and the Cubs win the game in the ninth. Pinch hitter Heinie Zimmerman knocks in Johnny Evers with the game winning run. Three Finger Brown gets the save. The Cubs actually sweep the series, including a 1-0 shutout by Chick Fraser, but the series is not without controversy. A near riot breaks out as Reds third baseman Hans Lobert (photo) goes into the stands, in the rowdy section known as “Rooter’s Row,” to spit at a heckler. After the game, he goes into the stands to beat up a different heckler, lands a few punches, and is suspended. ~In Vienna Austria a young painter is trying to get accepted into the Academy of Arts as he celebrates his 19th birthday (April 20). He will be rejected, and by the following summer is living in a homeless shelter. He will later move to Germany and try to take over the world. 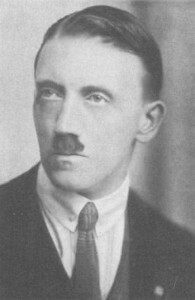 His name is Adolf Hitler. ~In the South Kensington section of London, a respectful 4-year-old boy who calls everyone “Sir” celebrates his 4th birthday (April 14). He will become one of the greatest actors in history. Later in life everyone will call him Sir: Sir John Gielgud. ~Charlie Chaplin turns 19 (April 15) in England. He won’t step foot in America for another two years when he comes as part of the Fred Karno troupe, along with a good buddy of his, Arthur Stanley Jefferson, who eventually changes his name to Stan Laurel. Chaplin’s first film “Making a Living” won’t be released until 1914. ~One of the all-time jazz greats is born in Louisville Kentucky, Lionel Hampton (April 20). He will move with his family to Kenosha Wisconsin, before settling in Chicago in 1916. That’s where he’ll take xylophone lessons and develop his musical style. 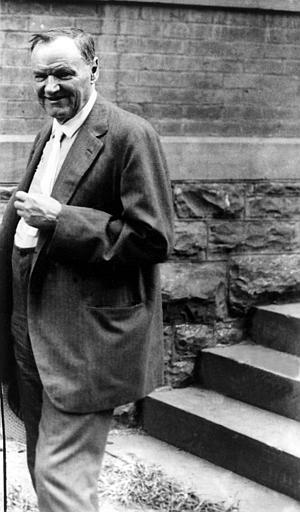 ~The most famous lawyer in Chicago, Clarence Darrow, turns 51. He is already well known for representing union leader Eugene Debs (who runs for President in ’08 and finishes third), and the assassin of Chicago Mayor Carter Harrison, but his two most famous trials are still to come—representing murderers Leopold and Loeb, and teacher John Scopes in the Scopes Monkey Trial. If he were so inclined, Darrow could have spent his birthday at the Garfield Park Observatory in Chicago, which opened to the public for the first time this week. Price Check: An annoying new fashion, huge “Merry Widow” hats (worn by women) ruin the view of the game for many baseball fans. These purple hats will set a gentleman back about $8. If you travel back in time, and wonder what the women are wearing under their long dresses, know this—they aren’t wearing nylons. They won’t exist until 1940.